The Week 3 Challenge is to: Make it Do! Above is a photograph of my little laundry station. The green laundry bin is cracking in all sorts of places, but I am making it do! The towels are the older ones--grungy, ratty, and bleached-stained-- you know the kind I mean. And the old bathroom rug is the same. I keep these in my rotation to get more use out of them drying my thrift store finds and hand-washables. I lay the old bath mat down to catch all of the major drips, and then wring things out in the towels before hanging them on an old-fashioned wooden drying rack. It's rather a fun process, and I enjoy it very much on a sunny Saturday morning! 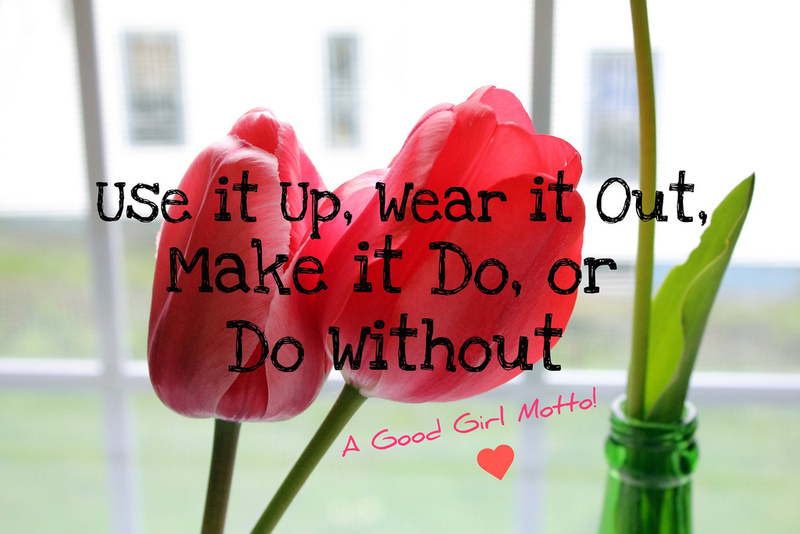 Making do also means mending--a forgotten art! I don't do a whole lot of mending myself, I'll admit. 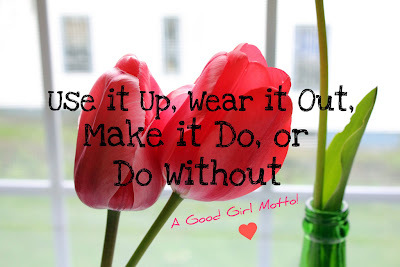 I have a giant old basket full of mending I need to tackle, so I am preaching to myself this week! 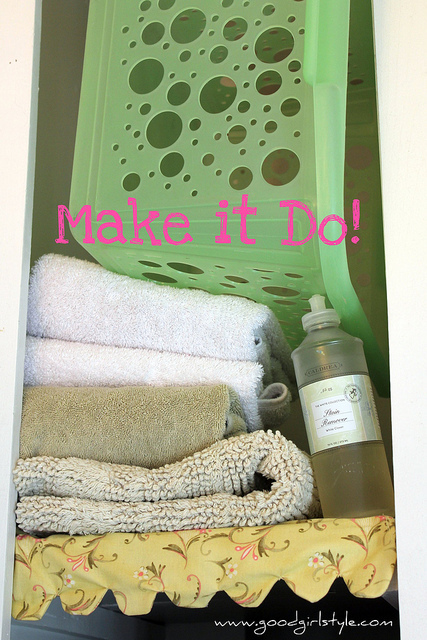 But I love to re-use "make do" with worn out things! When my very favorite winter socks got nasty holes in the toes, I cut the toes off and did a quick zig-zag stitch around the bottom, and now I have the cutest legwarmers! Love it. And then there's this bag, which was once (and still is) a very beloved Longchamp handbag, well-used, and looking a bit worse for it. There are decent-sized holes in all 4 corners. I tried to mend it, really, I did, but it was tough work since the material is a thick neoprene and the holes are oddly shaped. So! I thought, "OH, it's perfect for a new lunch bag! 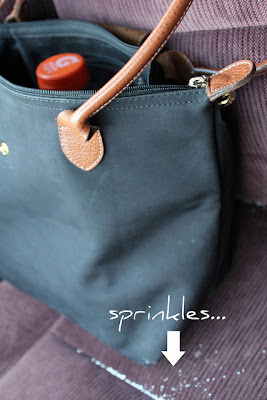 Nothing small can fall out of my lunch bag!" Ahem. SPRINKLES, friends. SPRINKLES will fall out of my lunch bag everywhere, probably forever. I had a container of sprinkle-covered chocolates that accidentally opened, and there is a veritable trail of sprinkles in my car, office, and house. I kid you not. 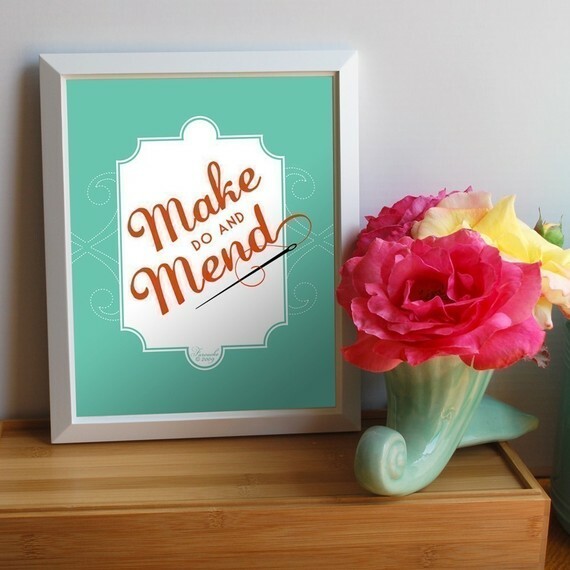 What do you/are you planning to "make do" with this week or "mend"? I'd love to hear your suggestions for my giant mending pile! If I make some progress, I'll be sure to share. oh, so much! Since we just moved into a new house, it's so tempting to buy things until our bank account runs dry, but we are just buying our time because we really can't afford it. And like our apartment, we will save, and purchase things one at a time. But it's so hard! I hear you, Suze! My computer and car are both on the fritz, but I'm trying to make them do as long as possible!! I'm sure you're just dying to make that house of yours "Pinterest Perfect" haha. I've been making my laundry basket "do" for well over a year. I hate it, its hard to carry everything down the stairs and around the corner, especially when its icy! I keep telling myself, when we move it wont matter, I wont be carrying laundry down stairs anymore! I also wanted to buy new containers to hold my delicious yog...instead I purchased the plastic lids for glass jars so I can reuse my jam and tuna jars (mom home cans both) to hold my yogurt until the next jar swap (empty for full) If I had had the rings for the jars I could just use plastic wrap, but mom keeps a tight grip on the rings.